Zlatan Ibrahimovic scored in each half in the Los Angeles Galaxy's 3-0 victory over the Vancouver Whitecaps on Saturday night. New coach, same result for the Vancouver Whitecaps. Vancouver (11-12-7) dropped their third in a row with a 3-0 loss to the the Los Angeles Galaxy on Saturday night just days after dismissing head coach Carl Robinson and his assistants, and moving Craig Dalrymple, technical director for the Whitecaps FC Academy, into the role of acting coach for the rest of the season. 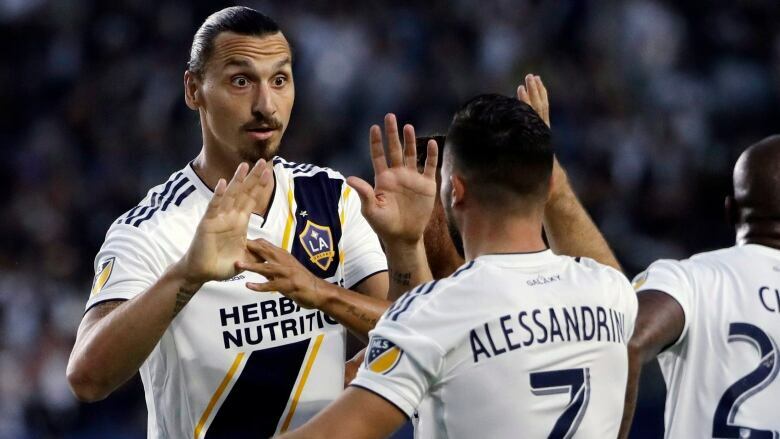 Zlatan Ibrahimovic provided the scoring for the Galaxy with a goal in each half as the Whitecaps failed to make ground in the race for the sixth and final playoff spot in the MLS's Western Conference. Vancouver sits in eighth at 40 points, five behind Real Salt Lake and four back of Los Angeles. Whitecaps forward Kei Kamara said despite the coaching changes, the club was mentally prepared for the match. "It doesn't really change much, you know, because it's the same team we're playing with. Same guys. I'm hoping it's the same attitude," he said. "If it wasn't, then it probably would've been six, seven goals (against) tonight." Ibrahimovic opened the scoring with a penalty kick in the fourth minute, finishing into the lower left corner. Romain Alessandrini drew the foul against Marcel de Jong. The Galaxy (12-11-8) made it 2-0 in the 58th minute when Ibrahimovic drove in from 40 yards out, faked out defender Aly Ghazal and sent home a right-footed blast from the top of the box. It was Ibrahimovic's 20th goal of the season. Alessandrini converted a penalty kick in the 77th minute to cap the scoring for LA. Dalrymple said he was pleased with the Whitecaps' fight, especially after Ibrahimovic's penalty, given the circumstances surrounding the club. "Not an easy week for the team but the challenge was there ahead of them in terms of getting themselves back on track and focusing on the task at hand," he said. "And to be honest, they had every reason to give in tonight." Regardless of the odds facing the Whitecaps in attempting to qualify for the post-season, Kamara said they need to push forward. We just gotta keep battling, keep fighting," he said. "We're not out yet. Like I said, until all the games are done before we can rule ourselves out."